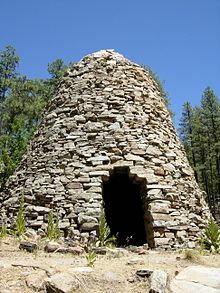 Historically, production of wood charcoal in districts where there is an abundance of wood dates back to a very ancient period, and generally consists of piling billets of wood on their ends so as to form a conical pile, openings being left at the bottom to admit air , with a central shaft to serve as a flue . The whole pile is covered with turf or moistened clay . The firing is begun at the bottom of the flue, and gradually spreads outwards and upwards. The success of the operation depends upon the rate of the combustion . Under average conditions, 100 parts of wood yield about 60 parts by volume , or 25 parts by weight , of charcoal; small scale production on the spot often yields only about 50%, large scale was efficient to about 90% even by the seventeenth century. The operation is so delicate that it was generally left to colliers (professional charcoal burners). Lump charcoal is made directly from hardwood material and usually produces far less ash than briquettes. Binchōtan , Japanese lump charcoal Briquettes are made by compressing charcoal, typically made from sawdust and other wood by-products, with a binder and other additives. The binder is usually starch . Some briquettes may also include brown coal (heat source), mineral carbon (heat source), borax , sodium nitrate (ignition aid), limestone (ash-whitening agent), raw sawdust (ignition aid), and other additives like paraffin or petroleum solvents to aid in ignition. 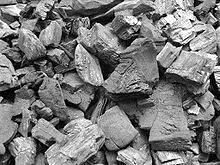 Extruded charcoal is made by extruding either raw ground wood or carbonized wood into logs without the use of a binder. The heat and pressure of the extruding process hold the charcoal together. If the extrusion is made from raw wood material, the extruded logs are then subsequently carbonized.